It's cliche to say "Good things come in small packages," but that's absolutely true in the world of racing, where teams strive to make cars and their components as small and light as possible to save weight. 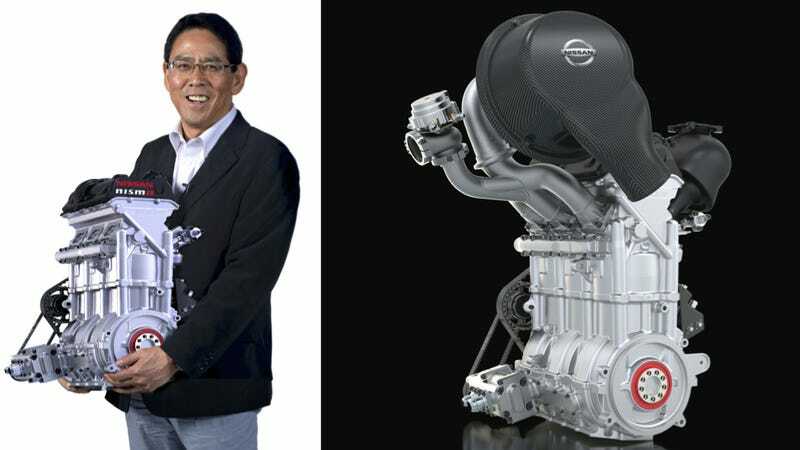 Judging by the size of their new Le Mans engine, it looks like Nissan succeeded. The motor you see above will help power the new Nissan ZEOD RC, the world's fastest electric race car, which is set to debut in the 24 Hours of Le Mans in June. With the wheels driven entirely by electric power, the ZEOD RC can hit speeds of more than 186 mph. So if it's electric, what do they need that engine for? Because it's there to take over for the electric motors. Nissan says that one lap of each one-hour stint will be electrically-powered, and after that, this tiny gasoline engine takes over. The motor is a 1.5-liter turbocharged three-cylinder engine called DIG-T R that puts out 400 horsepower and 280 pound-feet of torque while weighing just 88 pounds. (By contrast, the outgoing V8 engines used in Formula 1, no porkers themselves, weighed more than 200 pounds.) It has a better power-to-weight ratio than the new turbo V6 engines set to debut in F1 this year. This move also makes Nissan the first big manufacturer to use a three-cylinder engine in a major international motorsport. That makes sense, as three-bangers are becoming increasingly common in road cars as automakers strive toward efficiency. Now I'm gonna say what we're all thinking: Can we get a version of this engine on a street car? Please? Here's another cliche that's true here too: Good things come in threes.